Imagine a world where criminal defense attorneys face impossible odds every time they step into the court room. A world where prosecutors go years without a defeat, judges are unsympathetic, and clients have often confessed before the trial even begins. Phoenix Wright: Ace Attorney is no stranger to these challenges, but neither is any attorney working in the Japanese criminal justice system! If you are charged with a crime in Japan and brought to trial, statistics show that there is a 99 percent chance that you will be convicted. This alarming statistic reveals the highly dysfunctional legal system from which the Ace Attorney series clearly takes its inspiration; a system where even a victim of false allegations finds it impossible to escape conviction. Phoenix Wright, the eponymous lawyer of the popular Capcom games, constantly battles seemingly impossible odds as he fights to defend his falsely accused clients. While the fantastical anime nature of the games gives rise to outlandish courtroom antics and bizarre scenarios, the core concept of a lopsided legal system weighted against the accused is an exaggerated parody of Japanese society and their courts. The influence of Japanese culture on the Ace Attorney world is indisputable. Localization has inserted American pop culture references, and characters often vaguely assert that events happen "here in this country," yet, in reality, the world of Phoenix Wright is distinctly Japanese. Assisted on his adventures by two Hakama-clad spirit mediums, Phoenix ("Nick" to his friends) draws special powers from his "magatama," a traditional Japanese symbol. Japanese flavor pervades the whole environment. The top TV shows are the Steel Samurai and the Jammin' Ninja; our heroes seem to be constantly snooping around Shinto/Buddhist temples; and a deranged Japanese nationalist is encountered throwing seeds at birds in the local park. It is only natural that the courts also mirror their Japanese counterparts. Juries are virtually unknown and major criminal cases are decided by professional judges based on evidence presented by defense attorneys and state prosecutors. 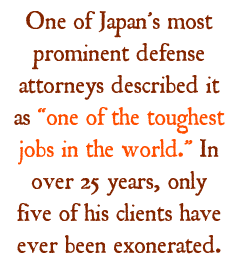 So, what makes criminal defense such a challenge in Japan? Takashi Takano, professor at Waseda University and one of Japan's most prominent defense attorneys described it as "one of the toughest jobs in the world." In over 25 years, only five of his clients have ever been exonerated. Yet this isn't a bad record, many attorneys go their whole careers without winning a case. Critics of the system are far from unanimous on the cause but the Phoenix Wright games touch on some of the more controversial institutions of the Japanese legal world, such as a powerful and detached prosecutor class, a police force that has lost public confidence, and a dangerous reliance on confessions as the centerpiece of prosecutions. These elements combine to make acquittal nearly impossible and grievous miscarriages of justice almost inevitable.